Stately Young Arabic Business Man Bandaging Sweater Shoulders, Smiling and Leans on Railing of Stairs of Restaurant. Young housemaid with rag working. 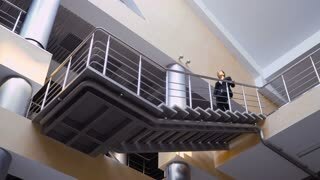 Woman wipes railing. Beautiful young woman stretching on the bridge in the city. Slow motion. 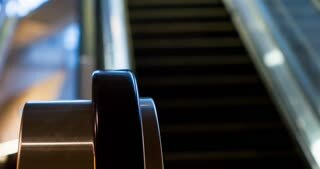 Athens, GA - July 5, 2018: Tilt-up shot of students walking up the stairs inside of The University of Georgia’s best student dining halls on south campus during the summer semester. 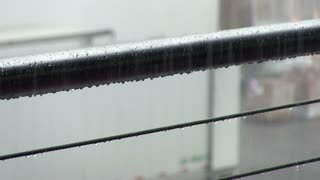 CLOSE UP: Monsoon rain punishes brown wooden railing around cool holiday house. Shot of front of moving train. 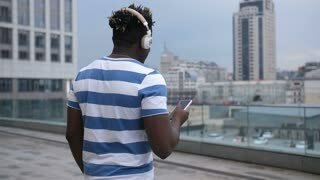 Rear view of african american male hipster in headphones chatting online using smart phone and leaning on railing while spending leisure in city. Trendy man browsing social media content on cellphone. 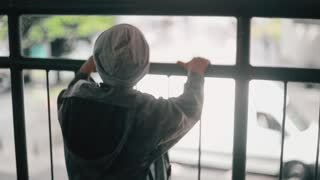 Back view of a little boy leaning on a bridge railing, turning his face to camera and back. Little boy climbing park slide stairs. The magnificent staircase in the Louvre Museum in Paris. France. 4K. 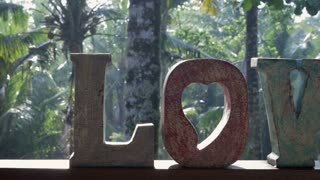 Slider shot of the word love on a railing overlooking a lush tropical jungle in Ubud, Bali. A slice of paradise on an island with palm trees and a rain forest. Atlanta City Skyline Rise Above the Railing. the camera rises on a diagonal above the Jackson Street Guard Rails to show the sun flare coming from behind the buildings. time lapse, timelapse of a steady snowfall on a windless night as snow piles up on a fence railing. Individual stellar crystals can be seen if one looks carefully. Video from the front of a rollercoaster looking and the riders as they go around a loop and turn. Zooms toward the front of a cruise ship. Passengers photograph Cape Horn from the deck of a cruise ship.